Can I Play The Weather Lottery Online? Read 2 Reviews! The Weather Lottery Exposed — How About the Lottery Based on the Weather? People seem to understand that most lotteries are operated to support causes, whether it’s education through the government or specific good causes. 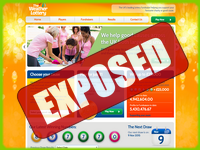 The Weather Lottery is Great Britain’s most popular fundraising lottery. It was established to support a variety of societies in education, health, sports, conservation, and air corps training. It’s owned by a public corporation registered on the UK Stock Exchange. The Weather Lottery is regulated by the Gambling Commission under licenses 000-002122-R-103901-017 and 000-002122-N-103910-018. It’s a cute little lottery that offers a once a week lottery based on the weather. Players pick six numbers based on what they think the second digit is going to be in the weather for six cities (Corfu, Istanbul, Tenerife, Innsbruck, Edinburgh, and Stockholm) published in the Daily Mail on Mondays. Prizes are paid out at £25,000 for getting all six numbers, £250 for five, £20 for four and £2 for three. What is strange is that the numbers are based on the Fahrenheit versus Celsius. 37% of the money collected goes directly to the cause that individuals choose. Part of the selection process at The Weather Lottery is choosing which charity or association you want the funds to go to. Each ticket costs £1, so that’s 37p that goes to who you choose. 63% goes to administration and prizes. As we were told, on average, 46% of the money goes to society (if they’re VAT registered) 38% if not. The rest goes to prizes and admin. Although this may not seem like a lot, 21% of the National Lottery goes to good causes, 27.5% (55p per £2 ticket) from the People’s Postcode Lottery and just 20% (20p per £1 ticket) from the Health lottery (Correct of Nov 2nd, 2015). The Weather Lottery is made up of hundreds of society lotteries, each raising money for themselves. PPS provide administration services. There doesn’t seem to be any restrictions on who can play at The Weather Lottery except people must to 16 years of age or older. When a person joins, they are given a unique 6-digit number (rather than picking themselves). A player chooses whose lottery they are entering when they register and money raised will go only to supporting that society. Who Is The Weather Lottery? The Weather Lottery is Prize Provision Services Ltd (PPS) products which are wholly owned by Boxhill Technologies PLC, listed on the UK AIM stock market. The Gambling Commission licenses PPS as an External Lottery Manager. The Gambling Commission also licenses director of the Company James Rose. One of the funny things about checking for complaints on The Weather Lottery is the number of people who misspell the word ‘whether.’ There are pages of people who ‘want to know weather’ something is correct or not. Add to that the number of pages that come up offering information on the weather. After wading through, there doesn’t seem actually to be any complaints. Besides the usual snail mail address, The Weather Lottery offers both toll-free numbers within Great Britain, a regular telephone number for outside of Great Britain and email contact form. All only seem available during regular business hours (GMT). Would you mind rating The Weather Lottery? This is a cute little lottery that does seem to do a lot of good though their list of societies that you can choose to donate to is very, very extensive. For people in Great Britain, this is a simple way to support your local society at the same time have a bit of fun. The Weather Lottery gets a thumbs up from the Lotto Exposed Team. We always support the idea of raising funds for good causes. A fantastic way to really help out some local causes. My chosen charity and local team both use the weather lottery, so I can support them both and try and win some cash whilst im at it! What a riot and nice to see something different. You’re not going to win a mega jackpot, but definitely learn a bit more about the weather in a bunch of places. I think it is a great way to have a bit of fun, maybe win something and help out some local societies.